Alexandre Henrard found himself in a familiar place today: on top of the podium at the UIPM World Biathle-Triathle Championships. 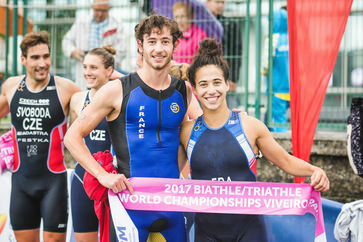 Henrard, the winner of individual gold in both Biathle and Triathle in 2015 and 2016, teamed up with Julie Belhamri to strike first blood for France in the Senior category of the Biathle Mixed Relay in Viveiro (ESP). In unexpectedly damp conditions, the French duo finished first ahead of silver medallist Czech Republic (Eliska Pribylova & Tomas Svoboda) while bronze went to host nation Spain (Catalina Balbin San Miguel & Carlos Garcia). However, these championships are about far more than elite athletes and the most successful team by a distance on day one was South Africa, who won an incredible six gold medals across the age categories. Czech Republic (Veronika Novotna & Martin Vlach) won Junior (Under 23) gold ahead of South Africa (silver) and Kazakhstan (bronze), while the Under 19 spoils went to Egypt (Salma Abdelmaksoud & Mohanad Elshafei) ahead of Great Britain (silver) and Portugal (bronze). 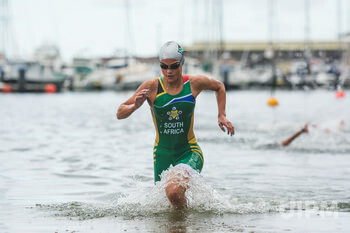 At the younger age groups there was gold for Egypt (Under 9), South Africa (Under 11 and Under 17) and Great Britain (Under 13 and Under 15). All four of the Masters titles went to South Africa, whose male and female duos swept the board at 40+, 50+, 60+ and 70+. Learn more about Triathle and Biathle and check out the results of all this weekend's action on the UIPM website. Picture galleries can be viewed in the media section. For video highlights visit the UIPM Facebook page.